The Thar Desert is undoubtedly one of the major attractions around Jaisalmer and rarely do tourists visit the fairytale city and not venture out into it. These days, there are numerous options for staying out in the desert in a tent or desert camp, ranging from basic to ultra luxurious. Think glamping! The majority of desert camps are located on and near the main road close to the popular Sam Sand Dunes, about 45 minutes west of Jaisalmer, where people flock to go on camel rides into the sunset. However, there are other options in the area that are non-touristy. An alternative location is the sand dunes around Barna and Khuri villages, about an hour southwest of Jaisalmer. It's less crowded and less developed there, providing a more authentic experience. The dunes aren't as extensive though. Yet, no matter where you stay, evening cultural programs with folk music will take place. When choosing a desert camp, especially ones around the Sam Dunes, it's important to do your research and pick a decent place that's properly managed. Otherwise, you're likely to end up with a dirty tent, poor food, bad service, and loud music. What's more, you'll be subjected to the noise coming from neighboring camps. You'll find that the tents usually have attached bathrooms with western toilets. However, not all will provide hot water and heating. Do keep in mind that photos on websites can be misleading too! Browse through these top Jaisalmer tent hotels and desert camps, for all budgets, to get an idea of what's available. 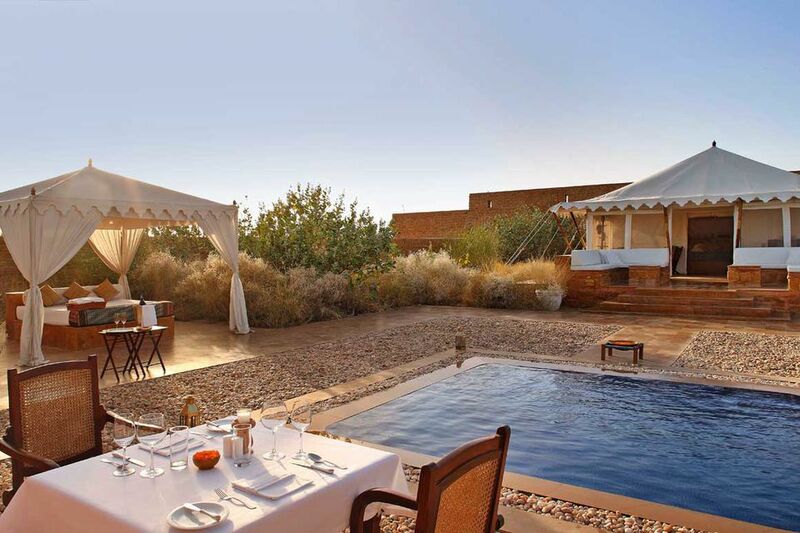 If you have cash to splash, when it comes to Jaisalmer desert camps, The Serai is the ultimate indulgence. If the thought of tented accommodations doesn't sound luxurious, you'll be in for a huge surprise at The Serai. The Serai also has a communal pool, spa, dining tent, and lounge bar for guests. Yet, one of the most romantic things about the Serai is that guests may drink or dine outdoors, anywhere on the estate. Perfect for sunset or dining under the stars! Location: One hour east of Jaisalmer. Cost: The Serai is open for the season from September to March end every year. Expect to pay 40,000 rupees for a Tented Suite, 50,500 rupees for a Luxury Tented Suite, and 78,500 rupees for the Royal Tented Suite per night, including breakfast and wireless Internet. Transfers and tax are additional. More Information: Visit The Serai website or compare prices and read reviews at TripAdvisor. Damodra Desert Camp is a relatively new and small luxury Jaisalmer desert camp (it opened in late 2011) with just 10 Swiss tents. Unlike other camps in the Sam Sand Dunes area, it's notably peaceful. The camp has a rural village location a short distance from the dunes. Many of the staff are local villagers, and it's decorated with traditional artifacts, giving it a traditional village feel. Unlike the more noisy camps, there are no DJs and loud music at this classy camp. Only puppet shows and Rajasthani dance. Camel safaris are carried out at private sand dunes, away from the crowded. Stargazing at night on the rooftop terrace is also possible. In terms of the tents, they're pushing and immaculate, including the bathrooms. They come with air-conditioners and heaters. You'll be surprised how comfortable staying in a tent can be! Location: Sam Road, Damodra Village (about 15 minutes from the Sam Sand Dunes). Cost: The camp operates from October to March each year. Expect to pay about 10,000 rupees per night for a tent, with all meals included. The rate also includes camel ride into the dunes and visit local villages. More Information: Damodra Desert Camp website. Prince Desert Camp is one of the larger Jaisalmer tented camps, with 30 tents. It's also one of the more luxurious camps near the Sam Sand Dunes, with attractive interiors and bathrooms in the suite tents that are a step up from the rest. It's set far enough away from the cluster of camps on the main road that there's no noise (this turns out to be a huge factor, as some get loud). It feels more authentic too, as there are sand dunes right in the back yard! An early morning sunrise walk in the dunes is unmissable. The food is delicious and there are hot showers in the tents. It's a well-managed camp with excellent staff and hospitality. Location: Lakhmana Road, Sam Sand Dunes. Cost: Expect to pay 7,000 rupees per night for a double tent, including breakfast and one dinner. Compare prices and read reviews on TripAdvisor. More Information: Visit the Prince Desert Camp website. If you're undecided about which desert camp to choose, what really stands out at Desert Springs Resort is the evening cultural show. It features renowned dancer Queen Harish of Jaisalmer and is the only place to see his legendary act there. He has performed his magnetic Rajasthani folk and Bollywood dances all over the world. In terms of accommodations, the property has 26 air-conditioned regular and deluxe tents (with mini bars). There's also a luxury spa on the premises, perfect for rejuvenating. The property is situated in a secluded location about 5-10 minutes before the Sam Sand Dunes. Cost: Packages (including room, all activities such as jeep safari and camel ride, dinner and breakfast) cost 7,500 rupees per night in a regular tent and 12,500 rupees per night in a deluxe tent. Compare prices and read reviews on TripAdvisor. More Information: Visit the Desert Springs Resort website. Perhaps the best Jaisalmer budget camp, Oasis Camp has a super central location on the main road right opposite the Sam Sand Dunes. It's ideal for those who want to be in the heart of the action and not pay too much. What's more, while many camps close during the off-season, this one is open all year round. Another thing that sets this camp apart from the others in the same price range is the personalized service and presence of the owner who goes out of his way to fulfilling guests' requests. The tents are decent enough with attached western-style bathrooms, although hot water is only available for a limited time in the morning and you'll need to take a bucket bath as there is no shower. Do note that only vegetarian food is served (although non-vegetarian can be provided at an additional cost). Location: Major District Road 53, opposite Sam Sand Dunes. Cost: From 3,500 rupees per night for a double, including breakfast and dinner. Compare prices and read reviews on TripAdvisor. More Information: Visit the Oasis Camp website. Pal Rajah Resort is a small desert camp with just eight luxury tents and three mud huts, bordering agricultural land and a sand dune with a picturesque sunset point. It's related to the very popular Hotel Fifu in Jaisalmer. The camp is ideal for a quiet local experience, as it's situated away from the main road and there are no other tents in the vicinity. Its welcoming and friendly staff provide courteous, attentive service. In addition to camel safaris, guests can go on jeep safaris to remote villages, and sleep out in the dunes under the stars. The only drawback is that only vegetarian food is served, although it is fresh and tasty. Cost: Expect to pay 5,500 rupees per night for a double, including breakfast and lunch or dinner, and camel safari. Compare prices and read reviews on TripAdvisor. More Information: Visit the Pal Rajah Resort website.